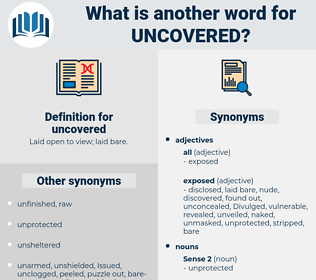 What is another word for uncovered? Laid open to view; laid bare. unlocked, underscored, rediscovered, Encountered, recovered, underlined, announced, confirmed, reunited, identified, unfolded, gathered, detected, collected, demonstrated, proved, concluded, confiscated, determined, learned, Collated, illustrated, observed, Recollected, Indicated, reported, realised, Caught, proclaimed, realized, combined, noticed, turned, assured, Knew, Told, declared, found, Transpired, tracked, seized, cracked, asserted, affirmed, reflected, Emerged, highlighted, emphasized, taught, pointed, noted, Ranged, Leaked, Manifested, Resulted, Helped, foiled, released, stressed, broke, Enabled, Remarked, showed, spotted, Yielded, saw, Signaled, signalled, added, smashed, Displayed, struck, sighted, Had, Allowed, Met. 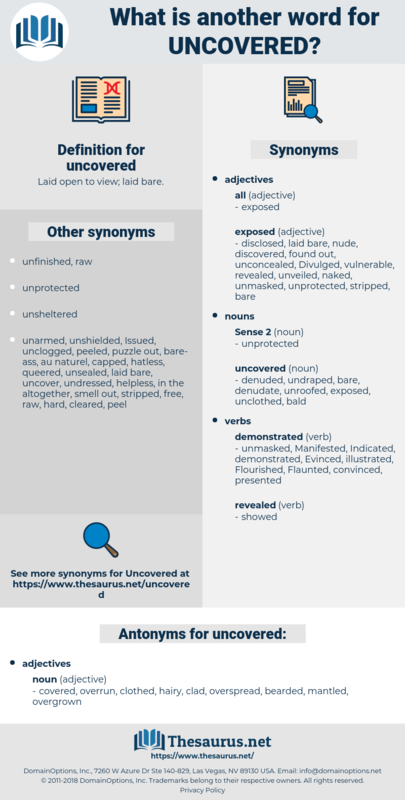 underscored, rediscovered, Encountered, unrevealed, recovered, ascertained, Denounced, announced, Retrieved, located, evidenced, identified, Discerned, Introduced, removed, traced, Elucidated, gathered, detected, Confronted, illuminated, collected, demonstrated, proven, proved, Learnt, Intercepted, confiscated, determined, learned, frustrated, Collated, recognised, illustrated, clarified, publicized, Compiled, Captured, recorded, Divulged, measured, solved, recognized, observed, pinpointed, Excluded, founded, documented, relocated, invented, delineated, Surfaced, Surveyed, Indicated, insured, Gleaned, Adduced, thwarted, reported, realised, Caught, relieved, experienced, realized, Obtained, noticed, induced, known, turned, cleared, declared, Betrayed, found, arrested, Transpired, emphasised, Encompassed, accrued, assembled, lent, tracked, Accommodated, seized, updated, Reached, Accounted, withheld, cracked, Emerged, showcased, highlighted, Brought, Harvested, emphasized, absorbed, pointed, noted, tested, Leaked, refreshed, dissipated, upgraded, Manifested, maintained, Compromised, settled, released, amassed, stressed, Carried, defeated, rolled, Marketed, laid, placed, Shown, day, figured, showed, Picked, Supplied, raised, spotted, sampled, Borne, worn, lifted, daylight, seen, Yielded, put, set, stripped, hedged, smashed, blown, struck, Dealt, up-dated, Gotten, naked. covered, overrun, clothed, hairy, clad, overspread, bearded, mantled, overgrown. And she uncovered her face. His head was uncovered, but that was not unnatural.